The First Saturdays Devotion (or Act of Reparation to the Immaculate Heart of Blessed Virgin Mary) is a Catholic practice which, according to the visionaries, has been requested by the Blessed Virgin Mary in several visitations, notably Our Lady of Fatima and the subsequent Pontevedra apparitions. This devotion, and the marian apparitions, have been officially embraced by the Roman Catholic Church. The devotion fits on the Catholic tradition to venerate the Virgin Mary particularly on Saturdays, which originated in the scriptural account that, as the Mother of Jesus Christ, her heart was to be pierced with a sword, as prophesied during the presentation of Jesus in the temple; such sword was the bitter sorrow during the Crucifixion of Jesus (which Catholic devotees understand as the union of the Immaculate Heart of Mary and the Sacred Heart of Jesus). Such sorrow is particularly bitterly endured on Holy Saturday after Jesus was placed on the Sepulcher (before the Resurrection on Easter). Devotees of Fátima believe that the First Saturdays help to console the sorrows of the Lord Jesus and the Virgin Mary for the sins against Her Immaculate Heart. In the Shrine of the Virgen de la Soledad, this devotion is being observed through a simple yet profound activity. Every first Saturday of the month, the original icon is being exposed for veneration beginning with a Rosary and Novena at 11:00 in the morning, followed by a "Misa de la Reina". 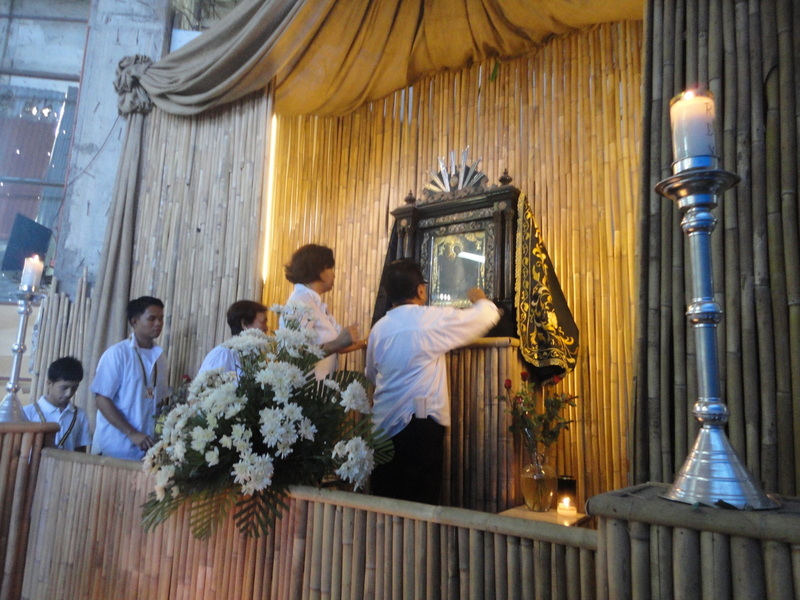 The monthly meeting and general assembly of the Cofradia de la Virgen de la Soledad de Porta Vaga follows to discuss activities uplifting the devotion to the Reina de Cavite. Everyone is invited to attend. ❝ Saturday is the day blessed by God more than any other day. God blessed the seventh day (cf. Gn 2:3) and Mary is 'blessed amongst women' (Lk 1:42). Saturday is the day sanctified by God, and Mary is also 'full of grace' (Lk 1:28). It is right therefore to dedicate this holy day to the all-holy woman. Saturday is also the day when God completed the work of nature, and in Mary, God completed the work of grace.